How to Check if a list is using Unique permissions or inheriting permissions from the parent? Navigate to the list and then go to List or Library Settings. The list settings page gives you the information whether the list has unique permissions. If the list or library has unique permissions, you'll get the text "This list/library has unique permissions", otherwise "This list/library inherits permissions from its parent." 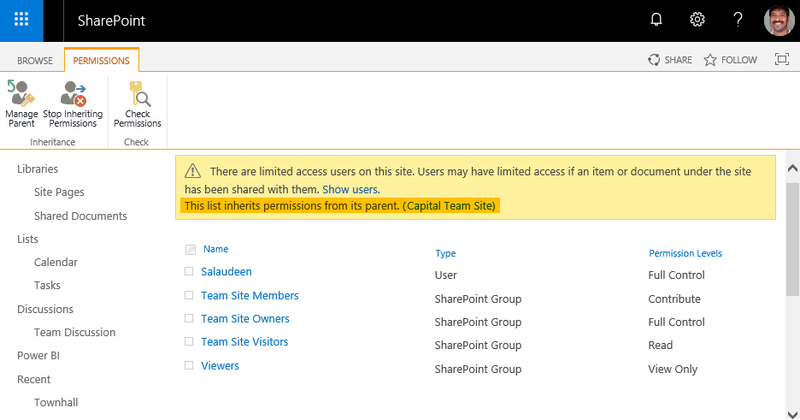 Lets modify the script a bit to get all unique permission-ed lists and libraries from a SharePoint Online site. Write-Host -f Green "List '$($List.Title)' has Unique Permissions"
Write-Host -f Yellow "List '$($List.Title)' is inhering Permissions from the Parent"
This script gets you all lists and libraries with unique permissions.